I was incorrect last week when I said that my next venture with the Big Green Egg was going to be a Turkey. I had forgotten that I had purchased a whole leg of Lamb and it needed to be cooked soon, so I looked up some recipes, got some ideas and cracked open a killer wine to go with it. I juiced a few lemons, added some Olive oil, salt, pepper and a concoction of herbs into a bowl. The Oregano, Basil and Rosemary were the key players but I was adding whatever I could find in the spice rack that I figured would go with Lamb. 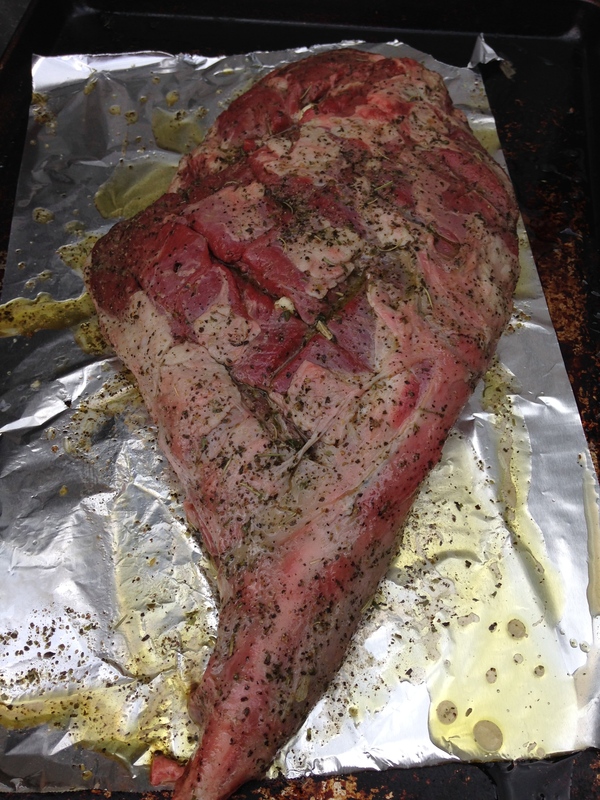 I then scored the meat with a deep crisscross pattern so I could slit some garlic slivers deep into the meat. I basted the whole thing up and let it sit for a few hours, ideally this should be done in a bag and left overnight in the fridge. 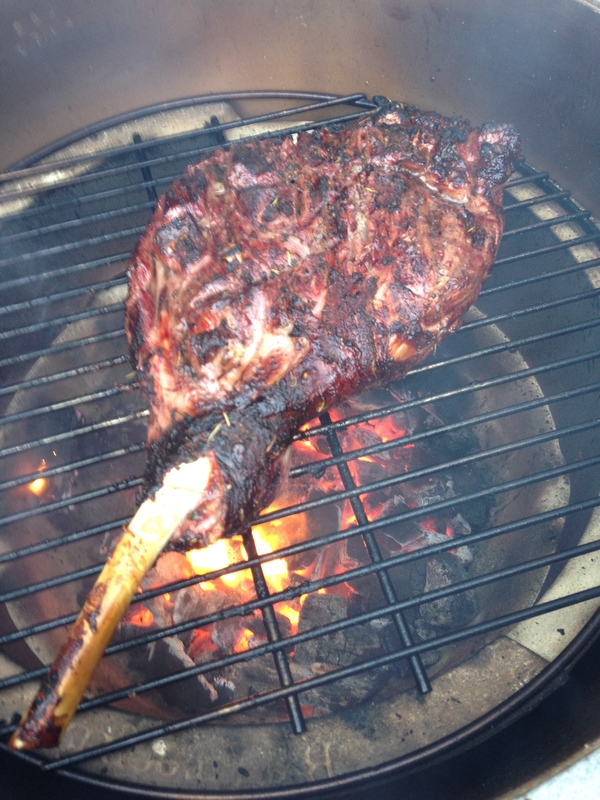 The meat was cooked for nearly 2 hours on an indirect fire with smoking chips added for flavor. I turned the Leg once and kept the dome temperature at 300F. When the meat was registering 140F I removed the indirect heating tray, opened the vents and cranked the heat to 500F. This allowed me to ‘reverse sear’ the meat and get some delicious blackened edges and really get the fat crispy. I think I let it go a little too long as the meat was medium well after I tented it for 10 minutes. It was however delicious and I would repeat the recipe without hesitation, knocking about 20 minutes from the slow cook to try for a moister, more rare finish. Syrah/Shiraz is probably the most perfect combo to pair with Lamb, so I took the opportunity to open the Clarendon Hills Syrah ‘Liandra’ 2007 for the dinner. It was ideal. Salut…. 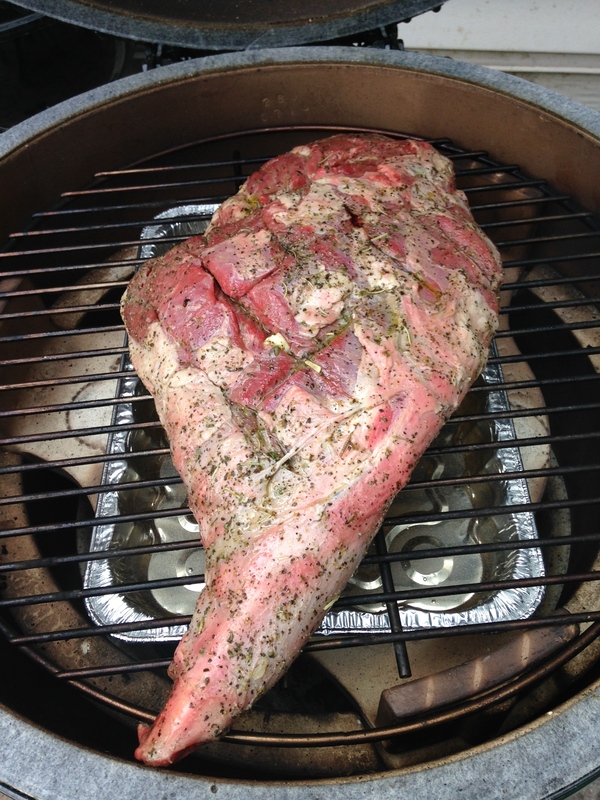 Updated: I just added another post about grilling a leg of lamb on the big green egg. Enjoy!